Living in the Denver mountain suburbs can present some unfamiliar challenges to folks from the city. Wildlife is wonderful to watch from your home but it can be a threat too. While I was at a closing Friday, the agent across the table was a friend and our clients were delighted to be buying and selling the home they both loved. As they chatted, my colleague and I realized we lived in the same neighborhood of Evergreen. It wasn't long before we started to discuss the change in weather and wildlife. A cooler, damp summer brought out insects we'd never seen before; odd looking bees with orange tails, etc. We agreed that we had seen fewer fox, more rabbits, a sure sign that cougars are back. This winter/early spring numerous sightings and several missing dogs and cats brought the Colorado Division of Wildlife to our valley. They concluded that there was at least one pride of mountain lions with in the open space and parks around us! So, for safety sake and home defense, I decided to buy a gun this weekend. I got ten percent off too. My husband and I love the "Big R" a new western department store in Evergreen. Big R has a huge selection of ranch supplies, clothing, boots, chicken coops, saddles, water tanks, and other large animal goods. It also offers the biggest selection of guns in the area. The staff and management work to develop relationships with customers, especially in the gun department. Mike from nearby Bailey, waited on us and I was glad for his patience in explaining calibers of buckshot and my tolerance for the "kick." While we waited for background checks, Mike described the differences of threats between bear, mountain lion, coyote and made suggestions about how to load the 12-gauge shotgun. Cougars are generally reclusive, but in the Evergreen and Estes Park area, because elk and deer are so accustomed to humans, the big cats will follow wildlife into populated areas. According to Ty Petersburg of Colorado Parks and Wildlife Management, "In the winter, when deer and elk populations are dense, big cats will follow giving their young a chance to learn hunting techniques." Each adult cat is feeding on 62 deer, 11 elk, and another 20 smaller prey (your dog or cat, fox, squirrel, coyote) - about 93 animals per year. Most interestingly, according to Ty, the mountain lions around Evergreen are not interested in humans but they are curious and are watching all the time. There were only 2 deaths in the State of Colorado from cougar attacks One was in nearby Idaho Springs just down the interstate from Evergreen. So, the likelihood of confrontation is pretty high in the Clear Creek County side of Evergreen. 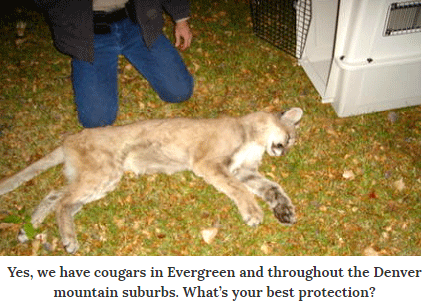 So, get a gun if you are hunting, but get a dog if you need protection from a mountain lion. 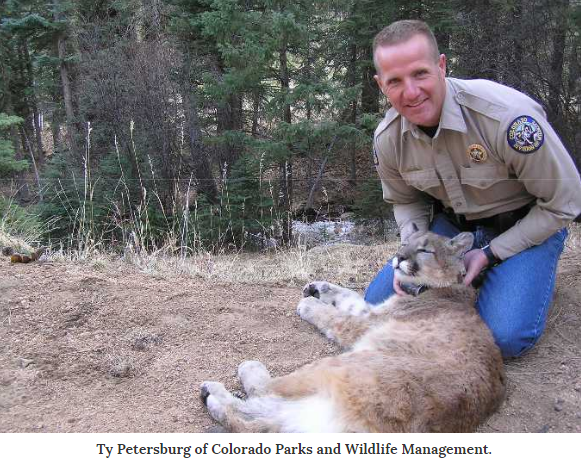 Here's a presentation by Ty Petersburg of Colorado Wildlife Management about dealing with cougars in the Denver mountain suburbs.